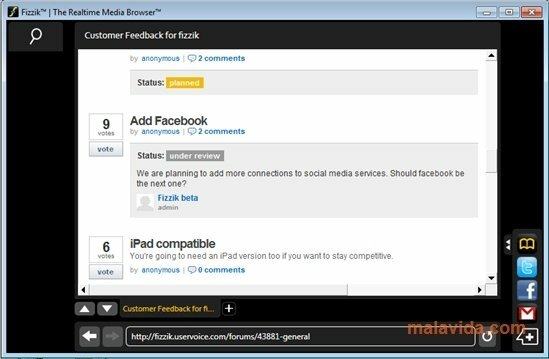 Fizzik is an innovating web browser that has made a clear bet on social networks, real-time news and videos in general. Nowadays, we no longer browse over the Internet as we used to do. That is the reason why this browser tries to adapt to new times and new technology. With Fizzik we will have shortcuts to social networks, like Facebook or Twitter, and to web-based mail services. A very noteworthy aspect of this browser is the ease with which we will be able to share any file or information with the social networks. It is also important to integrate with the RSS so as to make sure that we don't miss the updates to our favorite websites. It also has the added bonus of having a full screen mode so as to view the video that we find better, at the same time that with a couple of tools we will be able to quickly share them. New browsing trends require new browsers, and Fizzik can be a really good option. Even though they have just begun its development, it offers many possibilities that regular social networks users will really appreciate.